Christopher Poehlmann is a tall man whose long, silverybrown hair streams down around a serene face flanked by long sideburns and crisply divided by narrow green glasses. He is comfortable lounging in a chair designed by one of his favorite 20th century designers or in one hes designed himself. He looks arty. But this arty appearance belies a deep personal and professional history of risk, persistence and success: Poehlmann is an artist, but he is also a welder, designer, board member, businessman, husband and father. I have this kind of dichotomy between beinga designer of objects and something fluttering between artist and craftsman, Poehlmann says, but describes himself first as a designer. Riverwest is the world headquarters of his nationally successful CP Lighting, or so proclaims Poehlmanns voice mail. His workshop occupies the third story L-bend of a former nut factory at 3720 N. Fratney St. Today a Jolly Roger flies from the roof, testament that the building houses workshop lofts providing dens for creative and constructive types like carpenters and artists. Poehlmanns workshop contains walls of metal and recycled materials, an oven for cooking acrylic, welding torches and masks, scales and a giant packing peanut hopper. His aluminum and steel furniture prototypes are scattered about the floor, and his chandeliers and lighting fixtures spring from the walls and ceiling. A Biomega bicycle hangs in his office. Poehlmann, the designer, has made a name and a living by selling his lighting designs, which he both conceives and manufactures. His lamps, chandeliers and wall sconces have sold all over the country. He even has his own product line named after him, Poehlmann of ILEX Architectural Lighting. Hes developed the trendy, colorful acrylic popsicle lamps, which he says were born in Milwaukee. He also designs custom contemporary furniture. I always thought if you have a sculpture, why not make it so you can sit on it? he says.Poehlmann has a track record of angular furniture designs. Whether theyre part of his minimalist Chunky Chair or Papillio, the warped brushed metal obelisk of a numberless grandmother clock, Poehlmann seems to gravitate toward the trapezoidal. Its a sturdy form, simple and resilient, yet perhaps more dynamic than its other rectilinear brethren. Recently though, hes taken a creative risk with his New Growth chandeliers  welded and polished aluminum branches descending from the ceiling like a rack of pearly metallic antlers, sparkling with little Halogen bulbs. In college, Poehlmann studied psychology and taught himself photography, but traveling to Salzburg, Austria for a semester cemented his personal commitment to doing some form of art after seeing tons of cool contemporary design in Europe. He learned to weld in the early 1990s. Poehlmann traces his design roots to the mid-20th century work of Charles and Ray Eames, who brought the world the tandem-sling chairs familiar to airport-goers and the molded plastic/Fiberglass Eames chair. Poehlmann shares the Eames sense that comfortable furniture doesnt necessarily look comfortable. For his more complex designs, Poehlmann uses CNC, computer numerical control, which instructs a computerdriven router precisely how to move in three dimensions to achieve the desired design. When he uses CNC, Poehlmann looks to Riverwest fabricator Sign Effectz, Inc.
A member of the Riverwest Artists Association and a member of the Furniture Society board of trustees, Poehlmann has also participated for 11 years in the International Contemporary Furniture Fair. Poehlmann originally moved to Milwaukee from Chicago in 1986. He started making furniture in 1988 and lived and worked in Milwaukee until 1995 when he and his wife, Kate Kramer, moved to the Gulf coast of Florida. There she ran a Naples art gallery and he operated his design business out of their home in Fort Myers. They returned to Milwaukee in 2004 when Poehlmanns wife accepted the position of deputy director of UWMs Center for 21st Century Studies. Poehlmann also says they wanted to raise their daughter, born in 2003, in Milwaukee. 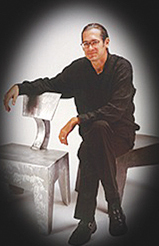 Working in salty Florida encouraged Poehlmann to try aluminum instead of steel, and he has continued exploring the material. Despite its skyrocketing price, aluminum is valuable not only because it resists corrosion but also because of its lightness. Poehlmann is happy to be back in cooler Milwaukee  he no longer has to weld in his Floridian backyard in a puddle of his own sweat.